Urogenital tuberculosis (TB) is the second-most common form of extrapulmonary TB, with more than 90% of cases occurring in the developing countries. However, isolated TB of the testis is extremely rare and poses a diagnostic dilemma as it often masquerades as malignant lesion. Testicular involvement is rare among different genital organs, far behind epididymis, seminal vesicle, and prostate. Testis is involved usually from the tubercular infection spreading from the epididymis and rarely through the hematogenous route, isolated testicular involvement accounts for only 1.6% among different genital organ involvement.,, The rare occurrence of isolated TB of the testis therefore poses a diagnostic challenge even in TB endemic regions. The dilemma is further compounded by dearth of cytopathological diagnostic facilities and expertise to make a prompt diagnosis and necessary actions. Unfortunately, secondary and tertiary health facilities in most developing countries are ill-equipped to address this problem. This has resulted in unnecessary surgeries for medical conditions such as TB that can be treated with chemotherapy except if it is complicated. Against this background, therefore, we present a case of isolated testicular TB due to its rarity, diagnostic dilemma, and call for caution against hasty surgery on testicular swelling in TB endemic regions without a full evaluation. A 40-year-old male civil servant referred to Infectious Diseases Clinic of University of Maiduguri Teaching Hospital, a tertiary health institution and center of excellence for infectious diseases and immunology, on account of retrospective diagnosis of testicular TB. The patient presented with 7 months' history of painless swelling of the right testis. It slowly increased in size, and he had no other associated genitourinary symptoms. He was managed as a case of testicular cancer for which he had right radical orchidectomy. Chart review of his presurgery records indicates the following; Mantoux test = 13 mm (positive), testicular ultrasound scan showed normally sited testicles within their respective scrotal sac measuring 3.3 cm × 1.8 cm and 3.4 cm × 1.9 cm in their craniocaudal lengths and widths on the right and left, respectively. 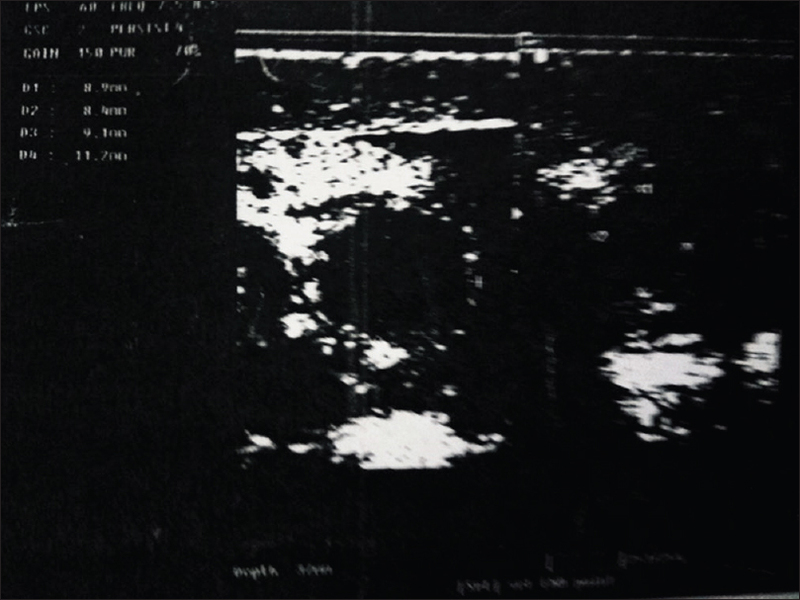 There were two well circumscribed hypoechoic masses measuring 11 mm × 9 mm and 9 mm × 8 mm in diameter located close to the right pole of the right testicle as shown in scrotal ultrasound print [Figure 1]. Abdominopelvic ultrasound scan was essentially normal. Chest radiograph showed prominence of aortic knuckle, normal cardiothoracic ratio with no evidence of focal lung lesion. Electrolytes urea and creatinine were essentially within normal limits. Liver function test was essentially normal. Full blood count parameters showed hemoglobin concentration of 14.7 g/dl, white blood count of 4.6 × 109/l, neutrophil % (54%), lymphocyte %(44%), and eosinophil %(2%). Platelet count was 238 × 109/l. Erythrocyte sedimentation rate (ESR) was 73 mm/h. Urine microscopy yielded no pus cells or red blood cell casts; it yielded no growth of microorganism. Urine analysis was essentially normal. 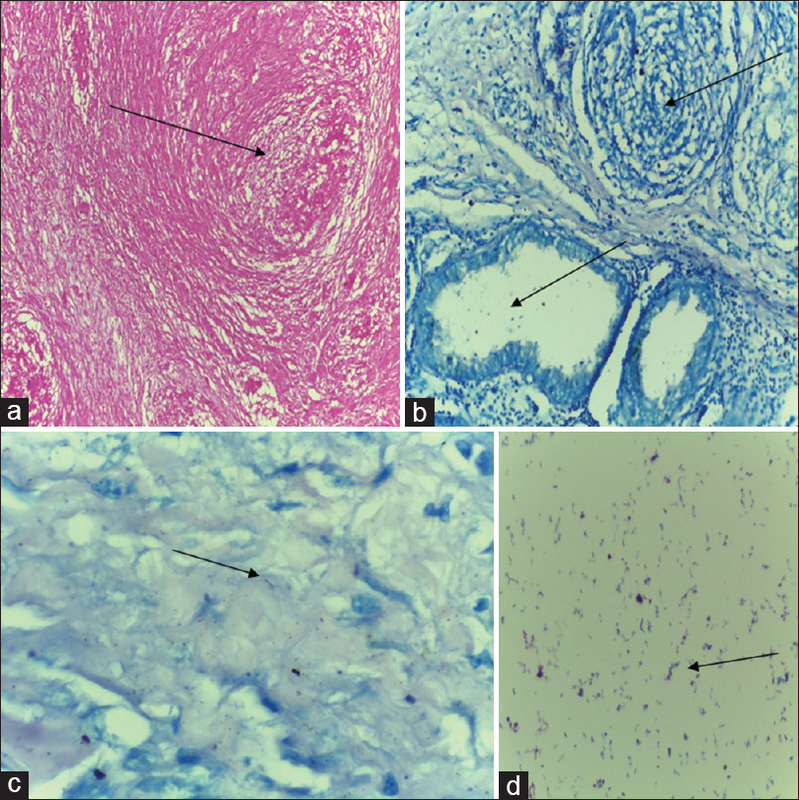 Histopathological findings of the right testis tissue showed granulomatous lesion within the testis with normal surrounding tissues. The Ziehl–Neelson (ZN) stain shows scanty acid-fast bacilli (AFB) as shown in the photomicrograph [Figure 2]. Repeat postsurgery investigation was essentially the same with the initial result; however, ESR after 4 weeks of surgery was 23 mm/h. The patient is currently asymptomatic and being monitored for recurrence of TB in the genitourinary system or elsewhere. In this patient, the finding on testicular ultrasound scan of two well circumscribed hypoechoic masses measuring 11 mm × 9 mm and 9 mm × 8 mm in diameter located close to the right pole of the right testicle is suggestive of TB rather than cancer of the testis. Epididymis and testicular TB findings on ultrasound scan include: (a) diffusely enlarged, heterogeneously hypoechoic, (b) diffusely enlarged, homogeneously hypoechoic, (c) nodular enlargement heterogeneously hypoechoic, and (d) milliary. Testicular tumors such as seminomas and lymphomas display homogeneous echo-pattern, unlike nonseminomatous tumors that are heterogeneous similar to TB. Furthermore, Color Doppler USG is a valuable investigation to differentiate between testicular TB and testicular torsion, as blood flow within the testis is either reduced or absent, whereas it is increased in those with inflammatory condition such as TB of the testis. However, this patient was counseled as a case of testicular cancer and had radical orchidectomy despite available facilities and expertise for cytohistopathological diagnosis in the hospital to refute or validate the working diagnosis of cancer of the testis. Histological diagnosis of TB of the testis in this patient was established in retrospect from radical orchidectomy tissue specimen. The surgeon that performed the surgery then referred the patient to infectious diseases unit for appropriate management. The need to consider TB among the list of differential diagnosis, thorough investigation of swelling and restrain from invasive procedures such as radical orchidectomy before establishing a definitive diagnosis of tumors in TB endemic region by means of cytohistological procedures prompted us to report this case. The conventional polymerase chain reaction (PCR) has been shown to be very effective in providing rapid diagnosis of TB from sputum, tissue, and some body fluids; unfortunately, it is not readily available in our setting, where it is available it is not usually within the reach of patients due to the high cost of investigation. The use of GeneXpert, a molecular assay recommended by the World Health Organization is valuable in the detection of Mycobacterium tuberculosis from sputum, tissue and some body fluids. It is a fully automated diagnostic molecular test using real-time PCR technology to detect M. tuberculosis and rifampicin resistance mutation in the rpoβ gene. The Xpert assay is a highly rapid, sensitive, and specific in the diagnosis of both pulmonary and extrapulmonary TB such as testicular TB. Urine culture may be of value in establishing the diagnosis of genitourinary TB, but it is limited by its low sensitivity and longer turnaround time of 6–8 weeks. Elevated serum lactate dehydrogenase and human chorionic gonadotrophin are of little value as they are often elevated in both TB of the testis and testicular tumors. TB remains a major cause of morbidity and mortality in sub-Saharan Africa. Unfortunately, most developing countries including sub-Saharan Africa that has the highest incidence of TB are bedeviled with a complex intricate of poverty, overcrowding, malnutrition, weak health infrastructure, dearth of skilled health workers, and near nonexistence of newer diagnostic facilities for proper evaluation of patients before surgery. Patients presenting with isolated testicular swelling should be thoroughly investigated for TB, especially in TB endemic region. This will obviate the need for unnecessary surgery and its possible complications such as damage to surrounding genitourinary organs, subfertility or infertility from radical orchidectomy as in this case. Surgery should be reserved for complicated cases where the desired outcome could not be achieved with medication. Abbara A, Davidson RN, Medscape. Etiology and management of genitourinary tuberculosis. Nat Rev Urol 2011;8:678-88. Jacob JT, Nguyen TM, Ray SM. Male genital tuberculosis. Lancet Infect Dis 2008;8:335-42. Kapoor R, Ansari MS, Mandhani A, Gulia A. Clinical presentation and diagnostic approach in cases of genitourinary tuberculosis. Indian J Urol 2008;24:401-5. Wise GJ, Shteynshlyuger A. An update on lower urinary tract tuberculosis. Curr Urol Rep 2008;9:305-13. Taken K, Ekin S, Canbey O, Günes M, Bulut G. Isolated testicular tuberculosis mimicking testicular cancer: A case report and literature review. SM J Urol 2015;1:1003. Cek M, Lenk S, Naber KG, Bishop MC, Johansen TE, Botto H, et al. EAU guidelines for the management of genitourinary tuberculosis. Eur Urol 2005;48:353-62. Rajpal S, Dhingra VK, Malik M, Kumar R. Tuberculous epididymoorchitis treated with intermittent therapy: A case report. Indian J Allergy Asthma Immunol 2002;16:51-4. Handa U, Bhutani A, Mohan H, Bawa AS. Role of fine needle aspiration cytology in nonneoplastic testicular and scrotal lesions and male infertility. Acta Cytol 2006;50:513-7. Sah SP, Bhadani PP, Regmi R, Tewari A, Raj GA. Fine needle aspiration cytology of tubercular epididymitis and epididymo-orchitis. Acta Cytol 2006;50:243-9. Muttarak M, Peh WC, Lojanapiwat B, Chaiwun B. Tuberculous epididymitis and epididymo-orchitis: Sonographic appearances. AJR Am J Roentgenol 2001;176:1459-66. Pavlica P, Barozzi L. Imaging of the acute scrotum. Eur Radiol 2001;11:220-8. Gómez García I, Gómez Mampaso E, Burgos Revilla J, Molina MR, Sampietro Crespo A, Buitrago LA, et al. Tuberculous orchiepididymitis during 1978-2003 period: Review of 34 cases and role of 16S rRNA amplification. Urology 2010;76:776-81. Chang K, Lu W, Wang J, Zhang K, Jia S, Li F, et al. Rapid and effective diagnosis of tuberculosis and rifampicin resistance with Xpert MTB/RIF assay: A meta-analysis. J Infect 2012;64:580-8. Shahi KS, Bhandari G, Rajput P, Singh A. Testicular tuberculosis masquerading as testicular tumor. Indian J Cancer 2009;46:250-2.